and with The Learning Curve ruler. 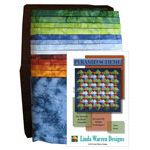 Includes pattern and fabrics to make 43" x 43" wall quilt. "Navy, "Fairway", and "Adobe" gradation fabrics are from SewBatik. Background fabrics; Hoffman 1895 Navy, which looks slightly more varigated than in sample quilt. 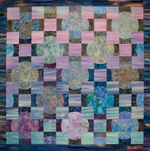 This quilt appears to be woven from strips of fabric, but in actuality the 3-D illusion is created by repeating one simple block. This is a great beginner project, or a fast project for experienced quilters. Includes instructions for four sizes. ONLINE ORDERS (USA Only): Payment is due at checkout. I accept PayPal, which includes the use of major credit cards. I do not accept checks or money orders. A PayPal account is not required, but I recommend it as a fast, easy, and secure way to make online purchases. New York residents will be charged 7% sales tax. PHONE ORDERS: If you would rather not place your order through our web site, please email me at iqquilts@yahoo.com, with subject heading "phone order." Include a name, phone number, and a good time to reach you. WHOLESALE: For wholesale orders, please email me at iqquilts@yahoo.com, with subject heading "wholesale order." You can also order my products through United Notions, Checker, Brewer, or Petersen-Arne. INTERNATIONAL ORDERS: For international orders, please email me at iqquilts@yahoo.com, with subject heading "international order." SHIPPING: All orders are shipped Monday through Friday via the United States Post Office or via UPS ground. Orders are packaged and shipped as quickly as possible. We make every effort to ship items in stock within three business days (but unfortunately this is not always possible). You will be notified by email when your order ships. If you are a retailer who carries my products, and you do not see your shop listed above, please email me at iqquilts@yahoo.com, with subject heading "shop listing." All Rights Reserved. No part of this site may be reproduced in any form without permission. Text and photographs are intended for personal use and are protected under federal copyright laws.